The unusually long, cold snap we’re enjoying has put paid to football fan’s fun all over Britain. But it wasn’t always this way. 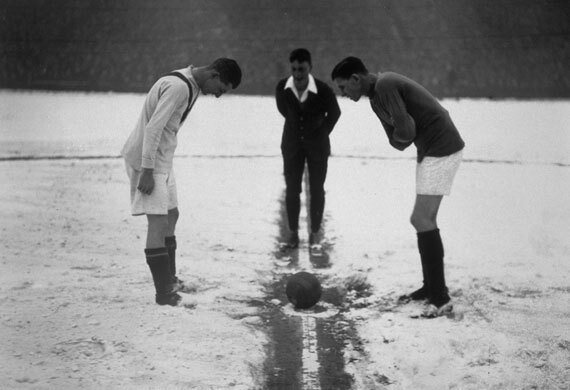 The picture above harks back to a different age, from the referee’s jacket and collar to the spirit of getting on with the game and to hell with the cold. I thought it might be of interest to find out a little more about the game captured here. It turns out it was a cracker. The game was played between Arsenal (in red in the picture above) and Manchester United (in the funky red chevron shirt on the left, which inspires this year’s effort) on January 16, 1926 before a palindromic crowd of 25, 252. Arsenal won 3-2 (have that, Mancs) with goals by Jimmy Brain (2) and legendary centre-forward Charlie Buchan. Buchan was in the first of three seasons at Highbury, having been signed that August by Herbert Chapman from Sunderland. His 21 goals that season, scored at the age of 34, propelled Arsenal to second place, then their best-ever finish. Also playing that day was Jock Rutherford, who had just re-signed for Arsenal for the third time aged 41. He went on until March 1926 and, via a spell at Clapton Orient, ended up opening a newsagent’s in Neasden. He is still the club’s oldest-ever player. As for United, they finished the season in ninth place. Huddersfield Town, Chapman’s former charges, won the league for the third successive season. It must have made for chilly viewing for those standing on the terraces. Highbury then was largely as it had been on opening in 1913. As the picture below shows, the ground had opening terracing on the north, west and south sides. Only the east side had seats, this in a classic Archibald Leitch stand with a gabled roof carrying the letters of ‘Arsenal’. The classic East and West Stands, designed by Claude Waterlow Ferier and William Binnie, the roof on the North Bank and the famous clock – now on the outside of the new Arsenal Stadium – came with the club’s success in the 1930s. Don’t feel too sorry for the fans in the ground, though, they could drink beer while watching and paid just a few pence to get in. Arsenal’s team that day would have lined up in a 2-3-5 formation favoured at the time. The team was Harper (GK), Mackie, John, Baker, Butler, Blyth, Rutherford, Buchan, Brain, Neil, Haden. If any United fans have information about the chap in the picture, their scorers or team that day then drop me an email. Thanks to Ian Kirk at Arsenal Football Club for his help with some of the details of this article.